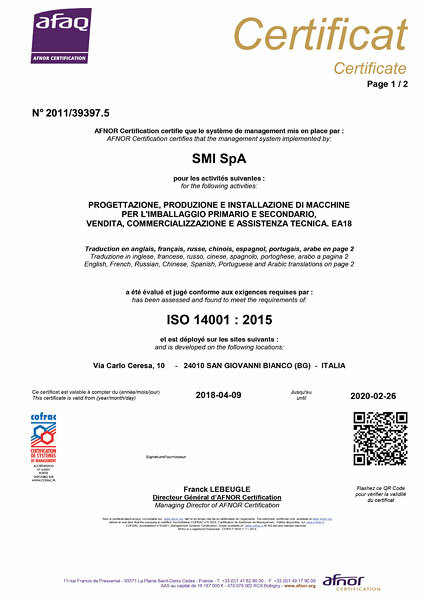 SMI S.p.A. and the other companies belonging to the SMI Group (SMIPACK – SMILAB – SMIMEC - SMITEC – SARCO.RE) have always been considering sustainable growth as one of the essential values of their mission, in order to achieve a close harmony between industrial activity, product quality, environment protection and safety at work. 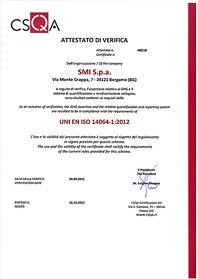 The companies of the SMI Group have adopted a Quality-Environment integrated management system, in compliance with UNI EN ISO 9001:2015 (Quality Management System) and UNI EN ISO 14001:2015 (Environment Management System).SMI S.p.A. has also adopted a Safety Management System, in compliance with UNI EN ISO 45001:2018. Quality, Environment and Safety are three essential values to be taken into consideration during the production process, in order to create a harmonious co-existence between individuals, technology and nature and for offering a valid contribution to customers and to social development. One of SMIGroup's priorities is getting the company’s workers, suppliers, customers and the public involved with the principles and values of its corporate mission in terms of environmental respect and safety at work. In order to pursue its policy, the company has adopted a series of strategies, better described in the Quality – Environment – Safety Policy. Environmental respect is an essential value also influencing important corporate choices, such as the renewal of the company car fleet with new electric vehicles generating low CO₂ emissions. Concerning sustainable development and environmental respect, the companies of the SMI Group achieved successful results by replacing plastic components of the machines with steel components deriving from waste material. A concrete example of SMIGroup's commitment to energy saving and eco-friendly solutions is the hydroelectric power station operated by SMIENERGIA; the plant, fed by the Brembo river, has a top production output of 6 GWh/year and provides “green energy” to the SMI Group's facility (offices, manufacturing workshops and laboratories) and to the national distribution network. SMI regularly measures the greenhouse gases it emits and identifies the possible areas in which it can reduce its "carbon footprint" such as, for instance, by encouraging the use of environmentally sustainable materials, pursuing greater energy efficiency and developing new low-power products. The ISO 14064-1 guidelines inspired SMI to that effect. Specifically, the survey that we conducted in 2014 on the company's environmental impact was audited by CSQA which found, thanks to the measures taken by SMI, a reduction of about 85 tons of CO₂ equivalent released to the environment compared to a total of about 920 tons. It is also interesting to point out that the installation in 2014 of three photovoltaic systems at the facility in Via Ceresa actually led to budget improvements. 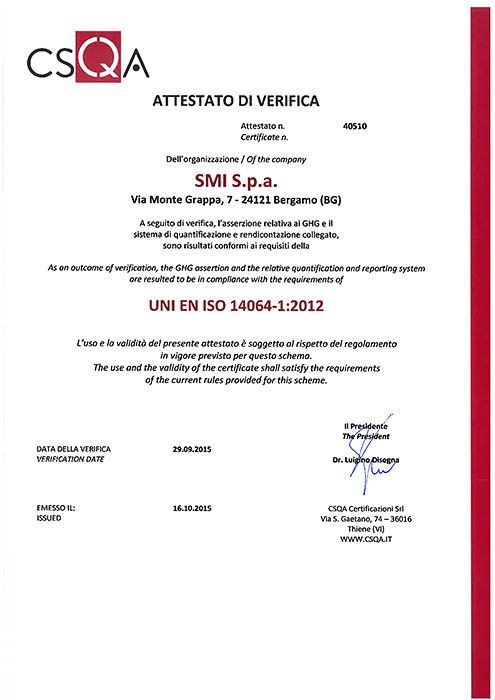 The verification was validated internationally in October 2015 by CSQA , when SMI obtained the relating certificate. The calculation was made by analyzing in detail both direct emissions of GHG (Greenhouse Gas), resulting from the combustion of methane gases, transport fuels, technical gases used and cooling gas leaks and indirect emissions linked to energy consumption.